This photo was made with my Canon S1 2S Power Shot, mounted on a tripod. 15-second exposure. 11/6/2007, 11:00 pm est. Through my 8x45 binoculars, comet Holmes appears as a very prominent smudge. It is easily seen with the naked eye as what looks like an extra star in Perseus. 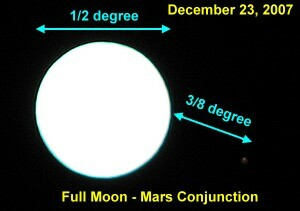 This photo of the full moon - Mars conjunction (≈3/8°), taken December 23, 2007, captures the northernmost (highest in the sky) full moon of the year. Earth will pass between Mars and the sun tomorrow. Mars will not come this close to Earth again until the year 2010.